Precision contracting, LLC was established in 2011 by Jess Pitts. Jess’ grandfather has been in construction as a contractor for the past 50+ years, and Jess’ father a superintendent for multiple large commercial jobs for 20+ years as well. Jess got started helping his father with projects around the house as a kid and in his high school years he started to assist his father on small side jobs. After graduating high school, Jess decided to make construction his career and went to work for a contractor who did site work and underground utilities. 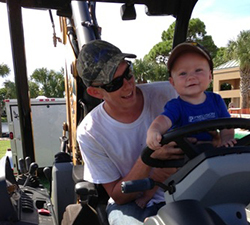 He started as a laborer and quickly worked his way up to operating heavy equipment. After about two years working for that company, Jess was finishing up his degree in Building Construction Technologies from Indian River State College. Upon graduating with his degree, he was offered to work for a company who builds extravagant, high end homes on Singer Island and decided to grab it! The more Jess worked for this company, the more he enjoyed the field of work, and so (with some “motivating” from his dad), he got his Contractor’s License. Jess took a leap of faith in 2011 and started his very own company. Now, all this hard work and experience later, Jess strives to operate Precision Contracting in a way that would make his work known for quality craftsmanship and an outstanding reputation. As a general contractor, construction manager, and builder, Precision contracting partners with architects, engineers, developers, and subcontractors to successfully manage and build your new building, construction project, or renovation. Our professional team can design a building to meet your business or residential needs and requirements. We will work with you from start to finish; building your commercial building or residential home. In the construction industry, there is no substitute for experience, integrity and professionalism. 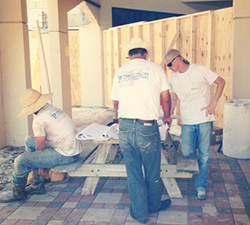 Precision Contracting was founded by Jess Pitts, a builder with the contracting lineage that you can rely upon. Moreover, clients of Precision Contracting have the confidence and peace of mind that comes from knowing that Jess is on site at every project to ensure its ultimate success.